We’ve been trying to hook up with a 2cv mate, Ryo, who moved from the UK to Northern Tuscany a few years ago – and, just as we were starting to think about moving on from Firenze, we received a text from him – he was going to be in Firenze the following day, so why didn’t we hook up there and convoy back home with him? A little light shopping later (tealights & crispbread on our part, a wardrobe for Ryo’s kids), we hit the autostrada towards Lucca, then north into the mountains, towards Barga – an absolutely delightful, beautifully preserved medieval hill town, with quite possibly the world’s best motorhome aire… Just on the outside of the town walls, there’s a big carpark, with a public loo – including hot shower – just around the corner. Great. 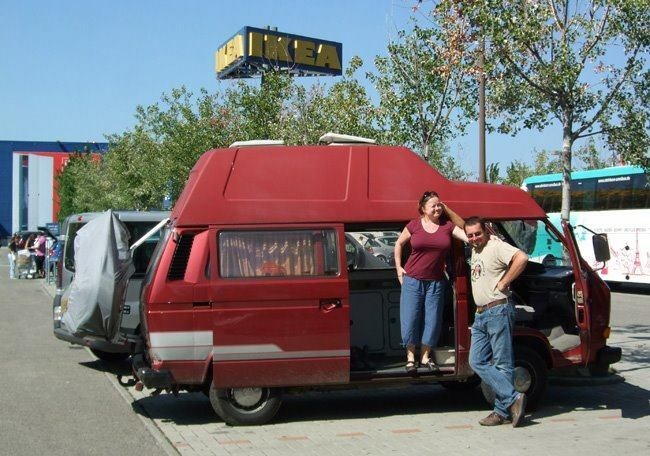 Even electricity and water points included in the nightly rent. The following day saw us heading South again, in the direction of Pisa. We’d been warned that it was just about the most heavily touristed place we’d ever see – and all those warnings were right… In a way, it was absolutely dreadful – tat stalls and street hawkers fighting for space with tour groups – yet the sheer magnificence of the Campo dei Miracoli managed to (almost) avert your gaze from that totally. Once away from the hordes of people all trying to get that sparklingly original photo of them holding the tower up (or pushing it over), the banana-bendiness of the tower started to assert itself more than the actual lean. Don’t get me wrong – it leans. It LEANS. But, when they were building it, they tried to mask the lean of the lower portion by building the upper sections assymetrically to compensate. As a result, it’s truly hilarious. The marshy ground that caused the lean extends under the whole area, with the main cathedral and baptistry both also leaning and wibbling – although nowhere near as spectacularly. The tower is open again to the public, after years of stabilisation work – we didn’t climb it, though, due to the timed tickets being priced at a level seemingly intended to pay for that long and intensive work within days. Along one side of the area lay what, for us, was the most impressive of the “miracles” here – the Campo Santo, a huge rectangular cloister surrounding a central yard allegedly laid with earth from the Holy Land. The cloisters themselves were the site of what Ruskin described as the “most important” frescoes in Italy – until a WW2 incendiary bomb (ours) turned the roof into a boiling lead coat of whitewash over the already deteriorating and fragile frescoes. As a result, the surviving frescoes are a mere shadow of what they must have been once – but are still impressive. 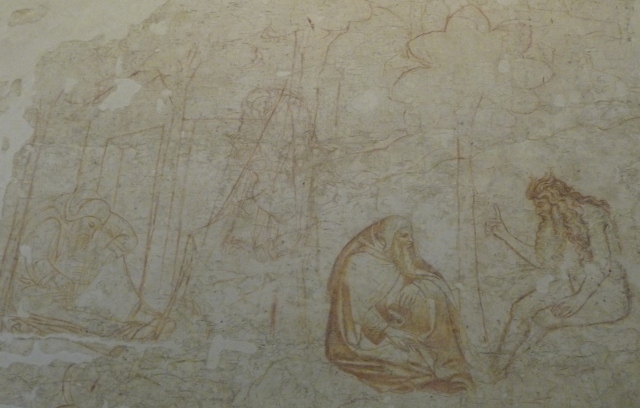 However, the destruction of the frescoes has enabled the Synopias underneath to be seen – the preparatory sketches drawn in chalk on plaster then painted over. Don’t ask me how, but a huge number have survived and are displayed in a dedicated museum on the other side of the square. The detail that went into these sketches was absolutely astonishing, and – in some ways – they were more evocative and resonant than the surviving works. 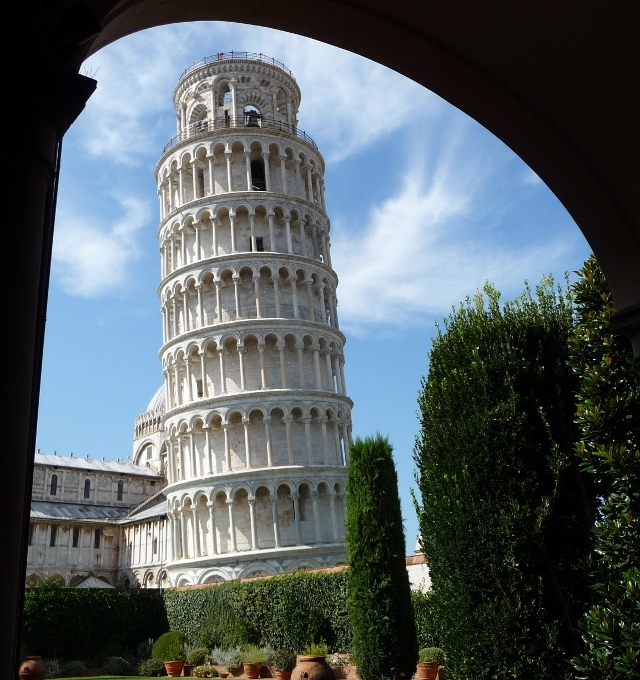 Including the separate museum of artworks from the cathedral – fascinating and beautiful, and with easily the best views of the tower – Pisa was a long and very knackering day. We meandered our way back to the van, in one of the pay carparks just outside the walls, to find that the group of good-natured Senegalese tat-hawkers hanging around were sat nattering in the largest shadow they could find – that of our van… Although we’d run out of time in the day, Pisa did seem to offer a lot outside the touron circuit – a wander down any of the streets away from the tower finding a city with plenty of life in it. 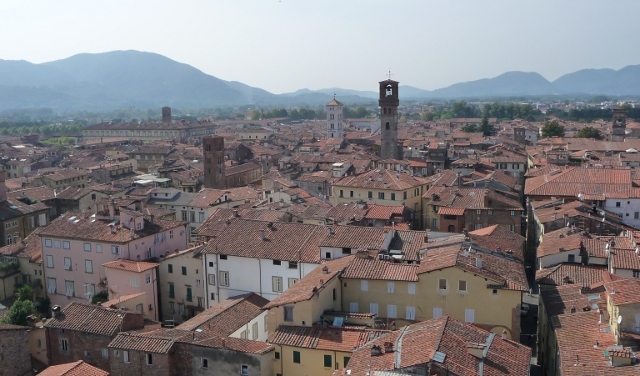 Lucca, by contrast, was one of the gentlest, slowest, most easy-going places we’ve been to. Another beautifully preserved walled city, containing numerous churches and towers, we spent two days wandering around just doing not very much – and loved every minute. Amongst the highlights were a total antidote to the Renaissance – Lucca’s Contemporary Art museum is currently housing an exhibition of “revealing works on paper” from the Peggy Guggenheim Collection, a varied miscellany of most of the big names of surrealist, cubist and other contemporary art styles from the 20th Century. The walls of the city themselves are preserved as a park, with their broad tops providing a tree-lined circular walkway and cycle path around the whole centre. 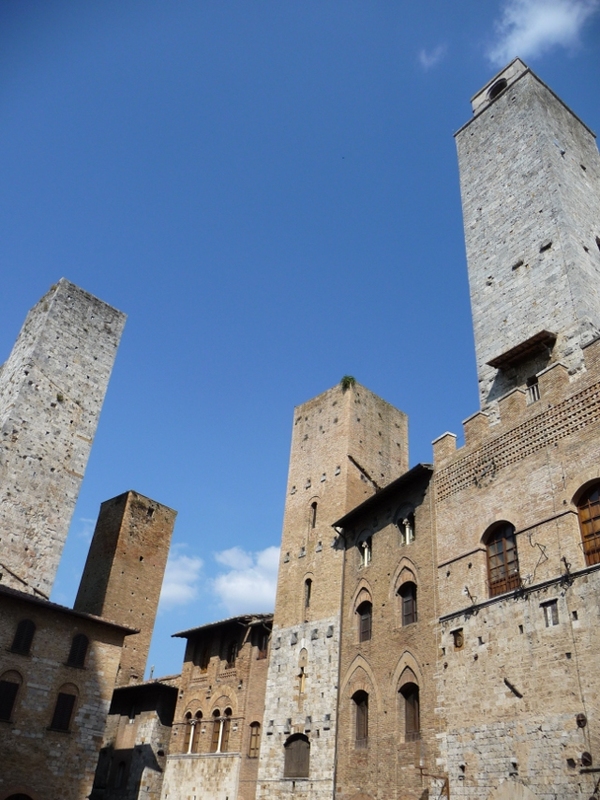 One of the towers in the centre, the Torre Guinigi, can be climbed for wonderful panoramic views above the rooftops – complete with mature trees growing on top of the tower. This was a town we could definitely see ourselves living. 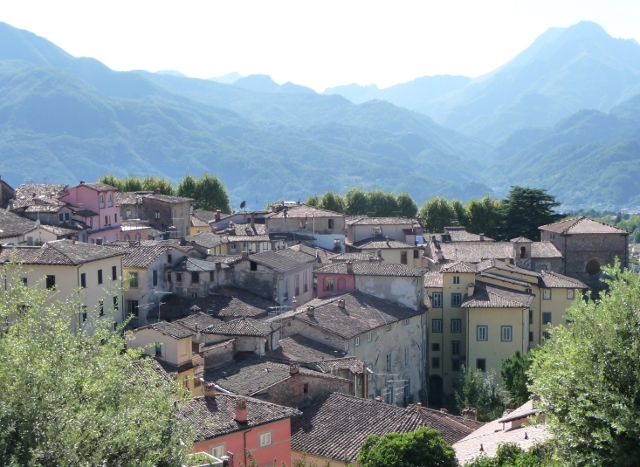 Whilst in Barga, we’d been along to a meal at a local Pizzeria – 20 minutes of hooning up, down and around twisty back mountain roads with Ryo in his 2cv (Oscar) – to celebrate a family birthday. 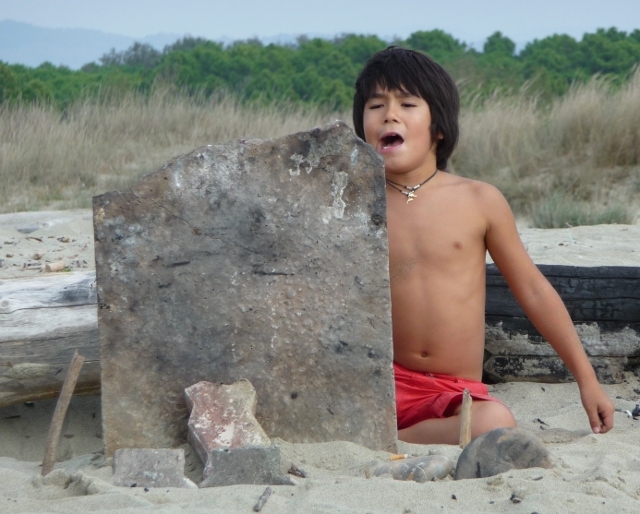 Ryo’s wife, Annalisa, belongs to a Barga dynasty – so their move back here really had been coming home. 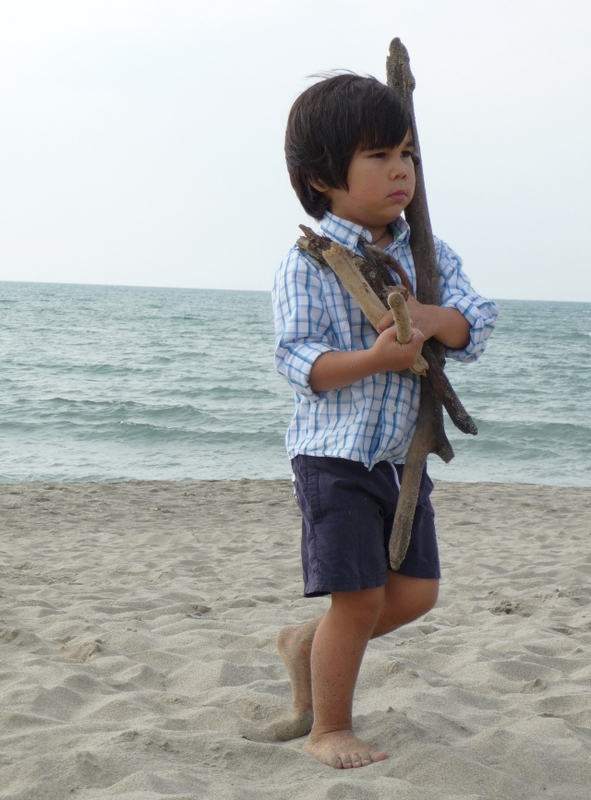 We’d also been invited to spend the Sunday with Annalisa, Ryo, Luigi and André down at the seaside at Viareggio – a resort east of Lucca which grew up around Royal patronage early in the 20th century. As a result, it’s full of huge art deco villas and gently fading grandeur. Beach-idling isn’t normally our thing, but this was a really lovely day – just pootling gently on bikes, back and forth around the town, past the shipyards where Superyachts are built, all wrapped up in delicious fried mixed fish served from a boat on the canal, and later quite possibly the best ice cream we’ve ever tasted. The landscape of Chianti slowly slid by us, rolling hills and vineyards merging seamlessly with umpteen roadside adverts for English-speaking estate agents. This entry was posted in Art & Culture stuff, By Country - Italy, Travel stuff. Bookmark the permalink. Pisa is one of those places you have to see once in your life but that was more than enough for me last year. 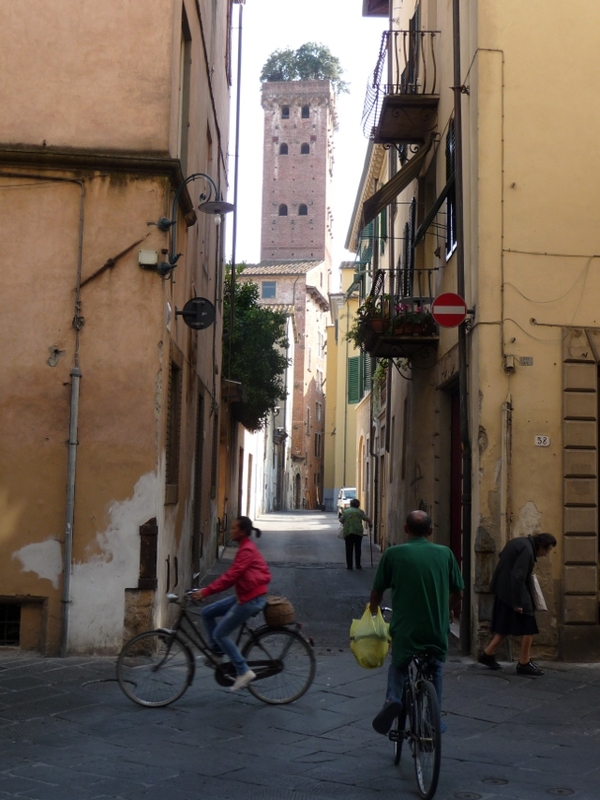 I much more enjoyed the smaller places like San G and Volterra, even some of those were also crowded with people. Fortunately, not many tourists as I was there in January and there was quite some snow at the time. A VW Polo on summer tires in the rolling hills of Tuscany is not a good mix! Still a beautiful landscape, even in winter. Even though I am not commenting here that often, I am still following your adventures whenever a new message pops up in my inbox. Thanks for all the work in sharing your journey which us folks who have to go to an office every day.. 😦 Safe travels!